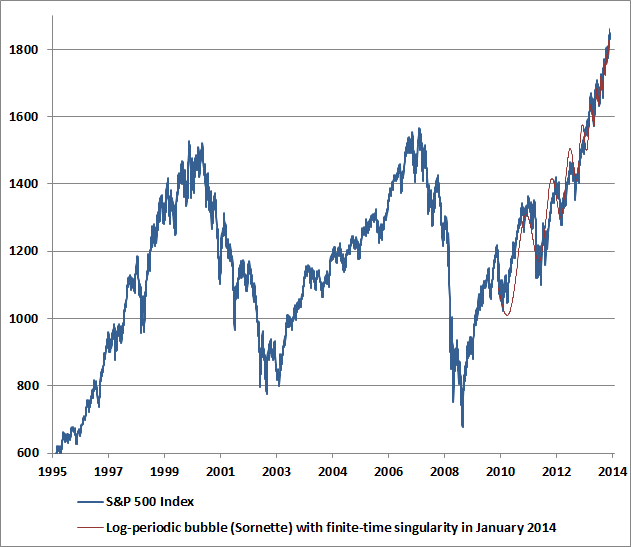 HOME > Latest > One commentators expectation of negative returns from US equities markets for seven years! One commentators expectation of negative returns from US equities markets for seven years! The post below from John Husman with accompanying chart caught our eye. The chart below shows the current position of the S&P 500. The light red line shows the log-periodic price trajectory that most closely approximates the present overvalued, overbought, overbullish, Fed-induced speculative run since 2010. While the initial gains from the 2009 low until about mid-2010 represented what we view as a move from reasonable valuation to full valuation (our stress-testing “miss” was not on valuation grounds), I expect little, if any of the market’s gains since 2010 to be retained by investors over the completion of this market cycle.Despite very short-run uncertainties about market direction, I should note that we now estimate negative prospective total returns for the S&P 500 on every horizon of less than 7 years.